Remember the Botanic Farm box I purchased from Memebox a while back? 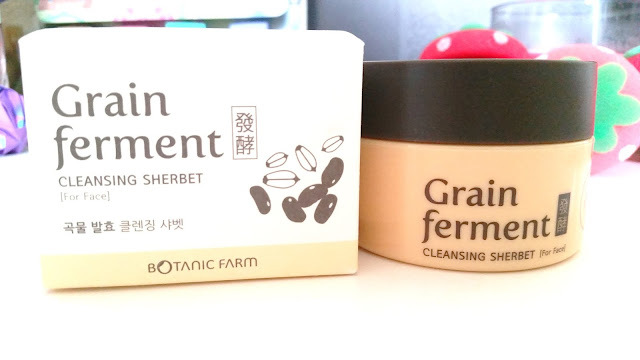 I shared in that unboxing post that I was excited about this Cleansing Sherbet and wondered how it would compare to the Banila Co. Cleansing Sherbet (which was my favorite then). Well it's been 5 months and the results are in. Beauties, I think I found a new favorite Cleansing Sherbet! Before discovering the realm of cleansing sherbets, I used cleansing oils. Cleansing oils are used as the first step of the double cleanse routine. Cleansing sherbets are essentially cleansing oils too but with one catch, they start off in a sherbet form instead of oil form. For me, that made it easier to handle/travel with. Which is why I fell in love with the cleansing sherbet concept. Since discovering the cleansing sherberts, I've tried many to find the best one for me. I thought Banila Co was the one, but man, I had no idea there would be something better out there. Product Description: A sherbet like cleanser with a firm yet creamy texture. 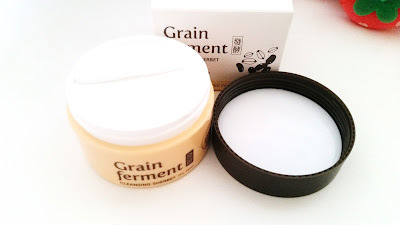 It's formulated with 3 kinds of grains, rice ferment filtrate (100ppm), rice bran ferment (100ppm), and soybean ferment extract (100ppm), to help brighten the skin while removing skin impurities. The sherbet cleanser melts into an oil form once it has been massaged onto the skin. To Use: Take an appropriate amount and apply it onto dry skin. Massage it in circular motions. The sherbet will turn into an oil form. Keep massaging and you'll see that the oil is lifting up your makeup. With lukewarm water, emulsify the oil on your face and massage for a little bit after. Then wash off and continue on to the second step of the double cleanse. Ingredients: Cetyl ethylhexanoate, caprylic/capric triglyceride, PEG-20 glyceryl triisostearate, polyethylene, PEG-10 isostearate, rice ferment filtrate (sake), saccharomyces/rice bran ferment, lactobacillus/soybean ferment extract, trihydroxystearin, tocopheryl acetate, butylene glycol, phenoxyethanol, fragrance. Packaging: The packaging of this Botanic Farm cleansing sherbet is pretty simple. 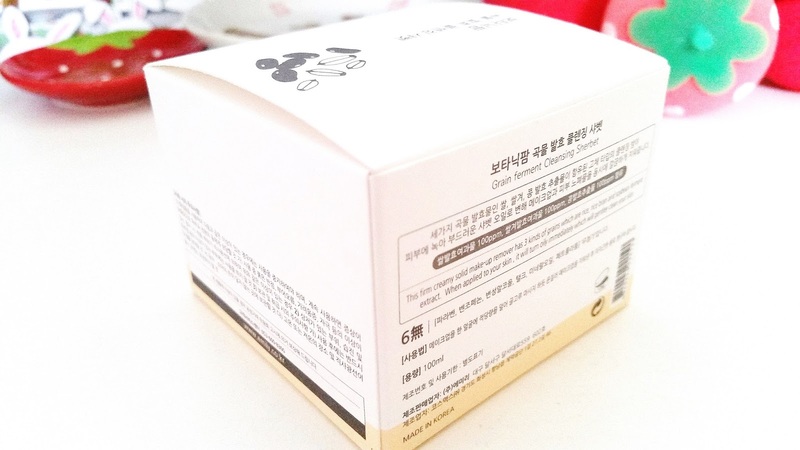 The outer box package contains information of the product in Korean. It does have the ingredient list and a short description in English. The packaging on the container is simple as well. The product comes with a spatula and an interior lid to keep the sherbet cleanser fresh. Scent: Despite its many fermented ingredients this product doesn't smell fermented at all. Instead, this cleansing sherbet has a floral scent to it. Probably due to the added fragrance. Color: At the sherbet stage, the product looks white in color. Once it turns into an oil, the product looks see through and a tad bit opaque. Texture: The sherbet starts off with a firm yet creamy texture. It can be easily scooped out with a spatula like a sherbet. Once it's massaged, it turns oil like, making it easier to spread around. For my cleansing test, I used brown eyeshadow, blue eyeliner, black mascara, my toughest lip tint, black liquid liners, orange lip crayon, and foundation. Before applying the cleansing sherbet I let the makeup sit for a good couple of hours because nobody puts on makeup just to remove it right away. So I decided to test it as if it had been worn for a while. This also let's the lip tint to set in. After that couple of hours, I added a good amount of the sherbet cleanser and massaged away. As you can see in the image below, they sherbet turned to oil and it looks like a dark purple color mess on my arm. After a good amount of massaging, I went to emulsify the cleanser with water then wash off. The result is my clean arm. Impressive huh? I started to love sherbet cleansers because they are travel friendly and easy to use. You essentially avoid the mess of an oil cleanser with a pump, so no dripping and no mess. Each Botanic Farm sherbet cleanser is good for 12 months after the opening date. However, I find that it won't take that long to finish, unless you don't use it often. I have been using this for 5 months now and I am almost done with my first container. (Yup, bought a backup already.) I think I'll have about 1 month and a bit more left in the container. So, for me, each container average out to last about 6 months (if I use it every evening), which is pretty decent. 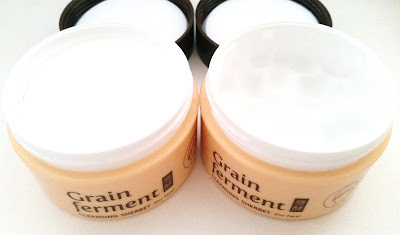 Final Thoughts: I was really surprised by the cleansing power of this Botanic Farm Grain Ferment Cleansing Sherbet. Sure, I hope it would cleanse well and all. However, up until now, none of my oil cleansers have been able to fully cleanse away my toughest lip tint. So when this one did, all I could think of was this is a keeper, must stock up on it. Would I repurchase this in the future? Yes. This is a keeper and I already have a backup in stock. I do also have a couple of other cleansing sherbets/ cleansing oils that I've got to force myself to use before purchasing anymore. However, I know which one I will be going back to once I finish everything. Do I think this is worth a try? Yes! A cleansing sherbet that works as awesome as this one is totally worth a try. As long as you are not sensitive to any of its ingredients, this cleanser will do wonders as a first step in the double cleanse routine. Disclaimer: This products was purchased by me. All opinions are honest and my own. This post contains some affiliate links, full disclaimer here.